First of all , I am grateful to former Principal Dr. Mathura Dass Sawtanter who commented these articles firstly in the form of Gita and presented it in simple hindi language for society . He is farsighted , prudent and social worker who tried like this . He is also my guide and teacher . Inspired from him , I am writing these articles . Saint Ved Vyas was the creator of Srimad Bhagavad-Gita who presented immortal sermon given by lord Krishna to Arjuna in the battle field . He represent as general youth with capturing in tension and false love with relatives . 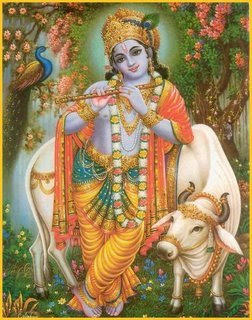 But Shri Krishna tells his real duty . To do your duty but not take tension for result . The book of Gita is in world's great language Sanskrit. Various commenters and investigators have been coming to present it in different language for millions of years . It is said then they are coming to reminding the human being for adopting the way of duty . I am also huge supporter of this matter that all people should study and deep think of Srimad Bhagavad-Gita So that we can get liberation during doing good works in this life . In reality , Shri Mad bhagavad Gita is a special psychological advice , after that understanding Vir Arjuna shows to do the victory of justice. Then we should uplift the bindings of religion , this Gita for youth is studied and I am deeply thought that if it is taught to School and College students , our youths can understand their responsibility very clearly . It is my personal experience that we get mental balance and concentration from regularly study of Gita , with which much helps to obtain education .So, it is politely requested to learned teachers and parents that they study this small and easy articles themselves and motivate to their young children to read it . In the age of falling human values in youth day by day , it will be good social work to give this motivation . Suggestions of readers are respectful offered / invited . Gita's first chapter is said Arjuna Vishad yoga . It is drawn the picture of Arjuna anxious mind in this chapter . Korav had abducted Pandav's state with cheating . Pandav tried that by any way they obtain their State - Part without fighting . But they can not succeed . Sinner dharyodan said clearly that he would not give them a place equal to needle's point . On this , the fight started with vigour assume it was competition of unrighteous and righteous . Arjuna is a brave young man among pandav . Pandav fully faith on his arms' power . Arjuna mind fills with deep love to see his relatives ready to kill each other . His intellect feels giddy . He is uncertain what to do . One side , the question is to do the duty , other side's question is to kill his relatives that's all he is nervous . His body feels to tremble , soft and small hairs of body is stood , mouth is dried up . In this way his rationality is destructed and his thoughts of duty and non duty is died . Arjuna is a devotee of Shri Krishna and Shri Krishna is a Charioteer in battle field . Arjuna tells Shri Krishna that O God ! why he kill elder aged man and relatives , I think that begging is better than fighting with relatives . Arjuna denied to fight. .His bow throw upon earth and sadly with filled eyes . He sets on the corner of Chariot . 1. How to Stop Youth Smoking? 2. How to Stop Youth Violence? 3. How to Stop Youth Drinking? 4. How to Stop Youth Gangs? 5. How to Stop Youth Unemployment? © 2008-2014 Inspiration for Youth.